I have to preface this review with a declaration of interest. Archerfield is my home course and therefore I am more familiar with both the Fidra and Dirleton than any other courses in the world and am proud to be a member of such a great place. When Archerfield opened in the mid 2000s it was quite an unusual beast. A private members' club in Scotland which really wasn't easy to play unless you were a member. They quickly opened 2 courses - the Fidra and Dirleton, both designed by Scottish golfer DJ Russell. Timing was everything and the membership grew before the financial woes of 2007 came along. It is still largely a private members club but it is no longer impossible to play as a non-member, more about that below. So, to the club and courses itself. The whole ethos around Archerfield is 'We play a different game'. There are no cliques, committees and arcane rituals around. It is a place to enjoy the company of friends and is very relaxed in style. The clubhouse is fantastic and the welcome you will get from the club drop, to the pro shop to the bar/restaurant is first class. Service is at a premium but it is in no way stuck-up or pretentious. The closest I have seen to it in the UK is Queenwood which is great company to keep! I try and play most Sunday mornings and my wife and 2 young kids will often come up for lunch afterwards - jeans are fine, kids running around more than tolerated and there are colouring pens and books to keep them entertained. To some this would be a horror I'm sure but it makes for a great club to be a member of. Anyway, you're probably not reading this to look to join (although there are still a few spots available if you are interested!!) so on to the review. Firstly, if you are visiting Archerfield for a one-off visit make sure you leave plenty of time to enjoy the practice facilities. There are 3 short games area, 3 practice putting greens, a range playable from both ends and a covered tuition area with the a gre hi-tech fitting centre. It really is class. The 1st tee on Dirleton is next to a putting green and the performance centre which includes some covered bays. Now, it's probably fair to say that I have a marginal preference for the Fidra course over Dirleton. It is a more open course which you can get by on even if you're not having a great day. Dirleton is a little tougher for the higher handicapper I think. Many of the fairways have gorse to the left or the right which comes into play if you are wayward. This probably wouldn't bother straighter hitters too much but over the years it has really grown up and gaps which previously existed have largely gone now and more planted. One thing that the Dirleton does have over the Fidra is that there are few holes directly into or with the prevailing westerly wind, and a lot more cross-winds which on a windy day can be a bit of a relief. 1st. A much tougher opening hole that on the Fidra. You need to keep it down the left hand side of the fairway to get a view of the raised green but too far left and you will run out into bunkers. The green is well guarded and if you miss left then you will reallys truggle to get it up and down. Bogey is never a bad score on this hole. 2nd. A nice shortish par 5 which gives a real scoring opportunitity. If you find the fairway with the drive (well protected by bunkers which eat in on both the legt and the right) then you have a good chance of getting there or thereabouts with your second. 4th. The shortest par 4 on the course and you don't need to be greedy off the tee to have a very short shot into this green. 9th. A tough finish to the front 9, aim for the left hand side of the clubhouse from the tee for a good line in with your long second shot - trying to run it through the valley isn't a bad idea as the green is hard to hold otherwise. 11th The back 9 has several strong par 4s and the 11th is the first of these. Again, it's all about accuracy off the tee but with bunkers, gorse and burns all to contend with this hole can really sneak up and hurt. 14th. Another good par 5. The green is a wide one but the left hand side makes for the easier second shot as you can see where you are going to approach the green from the best angle. 16th. A deserved SI 1. It's a dogleg right with out of bounds on the right hand side running all the way up this 444 yard par 4. There are also bunkers in play off the tee and a burn comes into play with the second shot if mis-hit. 18th. The 409 yard par 4 plays into the wind normally and as such takes 2 good knocks to get up. The fairway has gorse on both sides and many find the bunker in front of the green with their approach shots. Some say that the Dirleton plays more like a links course than Fidra - I guess that is because of the lack of trees and the greens probably have more linksy characteristics. Having said that, you shouldn't come here expecting a true link experiences as it's not. 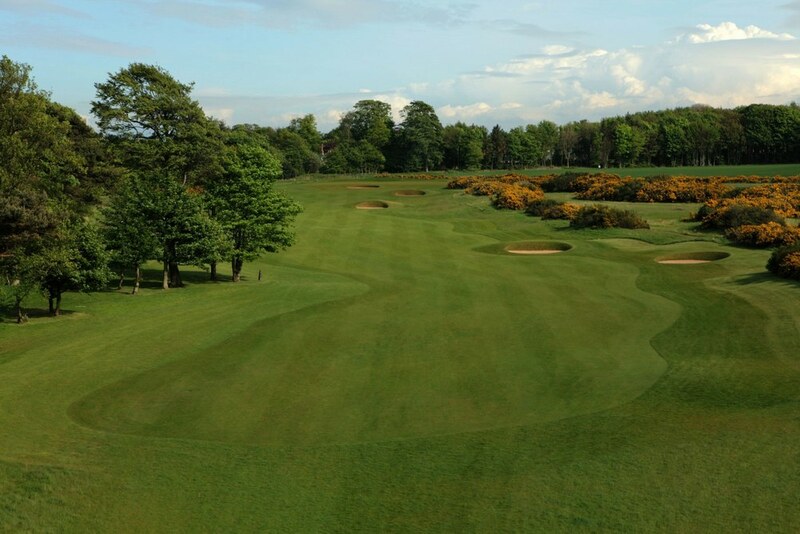 What you will get with Dirleton is a really good test of your game and will take a lot of thinking to navigate around close to you handicap.The condition will be great and the service truly exceptional. When Archerfield first opened it was strictly a private members' course but over time limited green fee play is possible. It's not something which is that widely advertised but equally you don't need to be Sherlock Holmes to find it - details are here. Having said that, it is £200 a person which is a lot given the other amazing golf around here. Now, the service, the overall experience and the practice facilities are all top notch but still, £200 is a lot! Consider staying at one of the great accommodation options as you will get a discount on the green fee. If there is a really large group of you though then you may want to look at the residential membership option as you get 6 nights in the fantastic lodges as well as a green fee for £3,495 as well as 12 rounds of golf. So if there were 12 of you then for £290 each you could get 2 nights accommodation in one of the lodges as well as a round at Archerfield before exploring some of the other courses. That's actually pretty good value! With a fair run, Archerfield is only 45 minutes from Edinburgh airport. There is such a variety of different courses in East Lothian that you could find a tour that fits most budgets - while I am biased I think it would be hard to argue this isn't in the top 5 places on the world to be based for a golf tour! The top end trip would include Gullane 1, Muirfield and North Berwick and then adding one of the courses at Archerfield or the Renaissance. The next 'tier down' from that, but still a great string of courses would be picking any from The Glen, Gullane 2 or 3, Luffness, Kilspindie, Dunbar, Craigielaw or Longniddry. Only Dunbar is more than 10 minutes in the car from Gullane so you really are spoilt for choice. The accommodation at Archerfield is great and the hospitality is really something special so do think about doing at least a night here. You will also get a discount on the green fee if you stay here. However when it comes to staying off-site then Gullane and North Berwick are your best options. See both of those pages to get verdict on them - despite being a Gullane resident I'd probably stay in North Berwick if passing through.